Norse myth abounds with tales of mighty warriors and their epic battles. 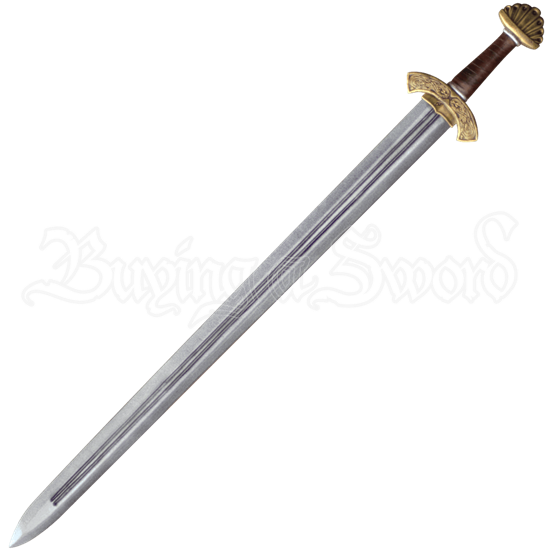 The Carved Hilt Viking Long LARP Sword makes a fine blade for any LARPer looking to embody the robust fighting spirit of these ancient northern people. The blade is made of shred resistant closed cell foam surrounding a fiberglass core with a strong latex coating, making this LARP sword safe and ready for live action roleplay. Its intricate-looking hilt is cast from polyurethane foam for a low maintenance sturdiness and steadfast hold, depicting a leather wrapped grip with golden colored pommel and guard, detailed with carvings. Due to the handcrafted nature of this LARP sword, there may be slight variations in its appearance. This LARP one-handed sword is a solid purchase for a beginner or a veteran. The cross guard is functional. The cross guard and the pommel are hard and don't give much at all. The foam quality is undeniably superb. After a few sparring sessions with it, with the proper care it has barely worn down at all. The one minor complaint I have is the handle's leather is slippery at times. The smoother leather can be a pain to grip onto. Other than that, amazing sword.